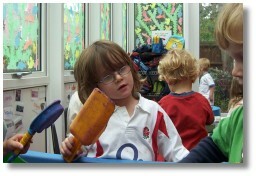 The nursery is organized into six areas of learning to assist the children in their development, and to achieve the aims of the Foundation Stage curriculum. The conservatory is our CD area were the children can enjoy and participate in the sand, water, play-dough, painting and arts & crafts. 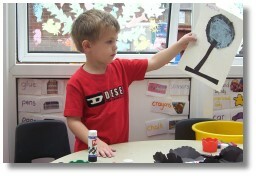 The children learn to explore colour, texture, shape, form and space in two or three dimensions. The back room consists of the large home corner, and this holds our corner shop which has goods, baskets, scales and a till. This home corner can also be the hospital, animal hospital and a fire station. This is our PSED area to encourage the children to have a developing awareness of their own needs, views and feelings of others. 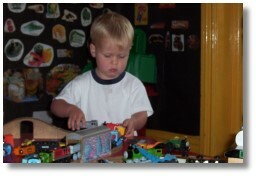 In this area of the nursery there are also Duplo peg boards, a magnetic insect table and a Brio railway table. There are also sofas and dressing up clothes for role play. The large hallway consists of our telephone box, working telephones and mobile telephones - all batteries and electronics have been removed for health & safety reasons. There are also two peg boards, a magnetic board, dinosaurs and mirrors. This area of learning is the KUW were the children learn to observe, find out about and identify features in the place and environment they live and in the natural world. The quiet room is our CLL area. Letterland is taught in this area, and to compliment and to work alongside Letterland there is a book corner with comfy sofas. This enables the children to enjoy listening to, and using spoken and written language and readily turn to it in their play and learning. This is also the area were we all enjoy story and singing time. The PSRN area is also in the quiet room, were the children have a wide choice of equipment including threading, sorting, measuring and comparing. 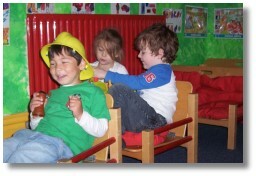 The children can also choose a numbered box and sit on it’s corresponding numbered chair. Inside each box are ten counting activities. In this area, the children are taught to count reliably, to recognize numerals, and to be able to use developing mathematical ideas and methods to solve practical problems. The Ten Town method is used to reinforce these skills. Our garden is the PD area, with large and small equipment to encourage the children to move with confidence, imagination and safety, and to be able to move with control and co-ordination. When a child is in a designated area there is still the opportunity for all areas of learning to overlap. All The Pre-School Centre’s activities and equipment have been carefully planned, organized and chosen to cover the six areas learning. This has the effect on the children, that even whilst he or she are playing and having fun, they are in fact learning and progressing towards the Early Learning Goals.